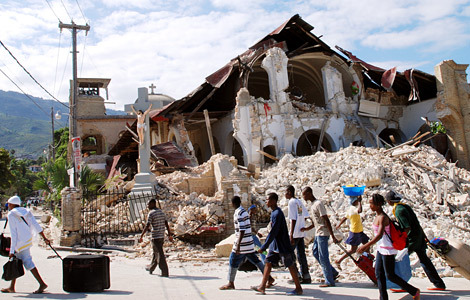 Marc talks with Rick Santos, President of IMA World Health, about the situation in Haiti. Santos was buried under a collapsed hotel for about 50 hours after the earthquake. Though the CBO found that the pending Senate legislation–likely to represent the bulk of the provisions in the final law–would reduce the federal deficit by as much $132 billion by 2019. We rank 43rd in the world in infant-mortality rates, behind Cuba, the Czech Republic, and the United Kingdom. Medicare per capita spending has grown at a slightly lower rate, on average, than private health insurance spending, at about 6.8 vs. 7.1% annually respectively between 1998 and 2008. There is a worthy national concern over health care costs, as they are the cause of 6 of every 10 bankruptcies. However, despite the concerns and actions of Congress, it’s estimated that the cost of health care is going to increase over the next few years. The hitch in health care reform is that the impetus seems to be throwing money at the problem, rather than finding out the cause of high cost – and any doctor will tell you that you have to treat the disease before the symptoms.